Follow in the footsteps of John Bunyan, author of the Pilgrims Progress who was imprisoned for his beliefs in Bedford. Details of his life are on display at the John Bunyan Museum. It is also worth finding the statue to him in Bedford. 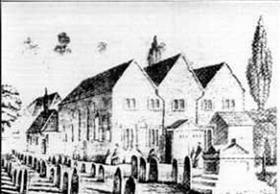 The church where Bunyan was once minister is now known at the Bunyan Meeting Free Church. It's on the same site as the barn which his congregation bought in 1672 to use as a place of worship. The John Bunyan museum is 5 mins walk from the bus station and 15 mins walk from the railway station. Car parking available in Castle Lane. Image courtesy of the John Bunyan Museum. Photograph © Copyright Robin Drayton and licensed for reuse.